As many of you know, the use of Python in education has grown tremendously in the past several years (see PSF Newsblog ). The Python community celebrates this trend, and continues to strengthen our connections to the world of education. PyCons first education summit at PyCon 2013, initiated by Naomi Cedar (who was recently elected to the PSF Board of Directors ), has been followed globally by many Python conferences holding education tracks and getting involved with community teachers and education leaders. Recently PyCon UK and EuroPython announced their upcoming education tracks. After attending the Education Summit at PyCon2015 in Montreal , I was inspired to read Nicholas Tollerveys wonderful booklet, Python in Education . Here Tollervey summarizes and explains Pythons use in education, recounts the history of the Python programming language, provides a case study of the amazing Raspberry Pi , and describes the important role played by the Python community in the languages popularity and ability to meet and adapt to users' needs. Q: What was your motivation for writing this book? NT: during my 20s I was a senior secondary school teacher in the UK - I taught music to teenagers growing up in areas of great poverty and deprivation. As a result Im passionate about teaching and learning - especially as a vehicle for emancipation. Unsurprisingly, I see programming and technical literacy as such vehicles. This is reinforced because I also have three school aged children. Q: How long were you thinking about and/or writing the book? 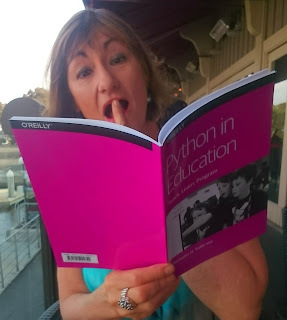 NT: Ive been thinking about programming and Python in education for quite a number of years. Given all thats happening regarding computing education in the UK at the moment, Ive also had a lot of opportunity to discuss the subject with a large number of teachers and developers and develop my outlook as a result (a process that is ongoing). The first draft of the report only took a weekend to write - although I made time during the following weeks for tidying up and editing (re-reading with fresh eyes is such a useful thing to do). Q: Did you have the books contents in mind or did you discover it via research? NT: The philosophical outlook was very much the result of the discussions mentioned in the previous point. I also spent a day at Raspberry Pi Towers chatting with Eben, Carrie Anne and Ben [ Editors Note: Eben Upton, Carrie Anne Philbin, and Ben Nuttall of the Raspberry Pi Foundation; Carrie Anne was recently elected to the PSF Board of Directors ]. The case study in the second section is the result. The rest of the book just wrote itself (as it were) and I, of course, was very careful to ensure I was reporting the correct information while referencing others. Q: Can you tell us a bit about your background in Python in education? An e-copy of Nicholass book can be obtained for free from O'Reilly . I highly recommend reading it, giving it to others as an introduction to this increasingly important topic, and getting involved in the education tracks at PyCons and in CS education activities in your communities. I would love to hear from readers. Please send feedback, comments, or blog ideas to me at msushi@gnosis.cx .